They are very busy, and this ban.do thermal mug reminds everyone around them that they are a woman on a mission. When you are a girl boss it’s easy to feel overwhelmed and pulled in a million directions. Day Designer® is a simple and easy system created to help find balance, focus and productivity. 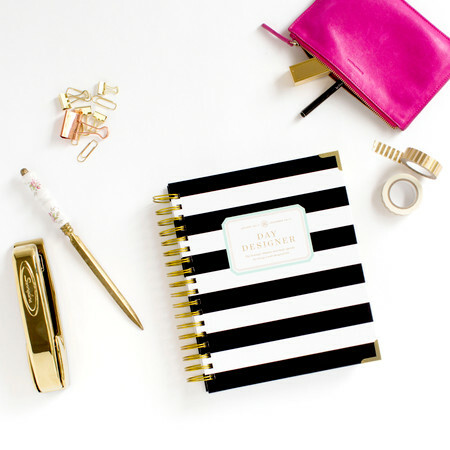 Get her this beautiful planner and she will be reminded of your amazing gift giving skills every single day. Staying charged is important and wayyyy more fun with this Metallic Rose ban.do Charging Cord! While others be trippin' over lifeless batteries, she'll be pumping hers with an energizing elixir wrapped in metallic rose! A girl boss can never be without sticky notes, and these super chic Kate Spade New York sticky notes are the perfect addition to her office. Instead of sticky notes being an eyesore, they are a beautiful addition to anything she sticks one on! A To-Do list is a must have when you are taking over the world! Even better is a to do list that motivates you each time you look at it! Every Girl Boss would love this Rifle Paper Co. Notepad. These gorgeous Rifle Paper Co. Writing Pencils will pair perfectly with the to do list! Everyone loves a great looking pencil, especially those girl bosses who use them to hold their hair back. There’s nothing worse than crafting the perfect cup of coffee, only to let it go cold because you got distracted by all the things you have to take care of in a day. This mug warmer keeps your drink warm with your computer’s USB port! Simply plug it in, and place your ceramic mug on top. Great for girl bosses who drink coffee or tea! This Kate Spade New York Luggage tag is perfect for the girl boss on the go! Whether it be a conference, meeting or vacation she will have luggage that is traveling with her in style!